endearing name!) are sent to investigate. They help Dave O’Brien and his sister Beth Marion uncover Dave’s partner, Alden Chase (later Stephen Chase), and Jack Ingram as rustlers. Watch for Tex Ritter’s wife-to-be, Dorothy Fay, as a girl at the party. This was to be the first of 8 pictures made by Houston for Grand National but, within a few months, financial troubles engulfed the company. Houston wound up at PRC as The Lone Rider two years later. “LONE RIDER RIDES ON” (‘41 PRC) Joseph O’Donnell “borrowed” his screenplay of two young boys separated as youngsters following a wagon raid in which their parents are murdered (by Karl Hackett’s gang) from Zane Grey’s novel ARIZONA AMES which was filmed as “Thunder Trail” in ‘37. Prior to that, the plot was appropriated for John Wayne’s “Westward Ho” (‘35) and again for Jack Randall’s “Across the Plains” (‘39). 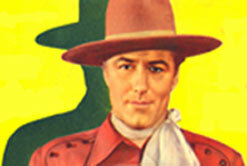 Even Roy Rogers’ “Saga of Death Valley” (‘39) used the two-brothers—one raised good, the other an outlaw—theme. So, by the time O’Donnell wrote it here for director Sam Newfield, the outcome was getting to be pretty well known. 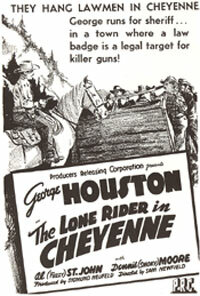 The plot serves to introduce PRC’s new singing cowboy George Houston to the screen as The Lone Rider when he returns 20 years after a wagon massacre to find the killers of his parents and brother, only to discover his brother (Lee Powell) isn’t dead, but brought up by Hackett (now a crooked judge) and his outlaws to be one of them. There’s a delightful “duet” between George and sidekick Al “Fuzzy” St. John on “Nobody’s Fault But My Own” (written by Johnny Lange and Lew Porter). Hillary Brooke, a dignified blonde a bit out of place on the range, got her start in two Houston B’s and soon moved on to bigger films—even Abbott and Costello’s TV series. 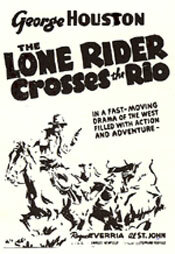 “THE LONE RIDER CROSSES THE RIO” (‘41 PRC) Pursued by a crooked lawman, The Lone Rider and Fuzzy wind up in Mexico crossing paths with the notorious bandit El Puma (Charlie King) who tries to frame George as El Puma by kidnapping the Alcalde’s son. “LONE RIDER IN GHOST TOWN” (‘41 PRC) A bit more rambling and incoherent than the usual Houston film as The Lone Rider and Fuzzy stop a huge gang of PRC badmen (led by Frank Hagney, Alden Chase and Reed Howes) from cheating an old miner and his daughter out of a gold mine. Screenwriter Joseph O’Donnell’s ending “borrows” elements from Buck Jones’ “Sundown Rider” which he liked so much he used it previously in Kermit Maynard’s “Trails of the Wild” (‘35). Not only George, but Fuzzy sings (“Calico Joe”) in this one. “LONE RIDER IN FRONTIER FURY” (‘41 PRC) East- ern girl Hillary Brooke comes west to run the ranch left to her by her murdered father. Framed for the killing is George Houston—The Lone Rider–who brings the real killers (Ted Adams, Karl Hackett, Tom London) to justice. Nice little performance by Virginia Card as Midge, outlaw Hackett’s daughter, who sings a duet (“A Love That Ended Too Soon”) with George. 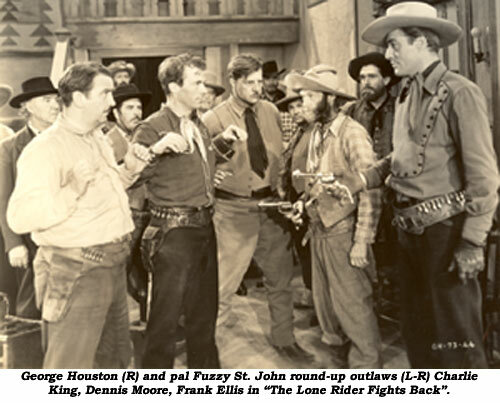 “LONE RIDER AMBUSHED” (‘41 PRC) It’s Houston’s turn to play a double role as The Lone Rider impersonates just-paroled outlaw Keno Harris allowing him to infiltrate Keno’s old gang and recover loot hidden after a robbery five years past. At least these badmen aren’t quite as gullible as some seen in other westerns—they DO wonder about his fancy clothes, his horse, his memory and his newly acquired singing voice belting out a duet, the very melodic “If It Hadn’t Been For You”, with Keno’s old love interest, Maxine Leslie. Naturally, George’s banty-rooster sidekick, Fuzzy St. John, is in on the fun. A pretty watchable entry written by Oliver Drake. 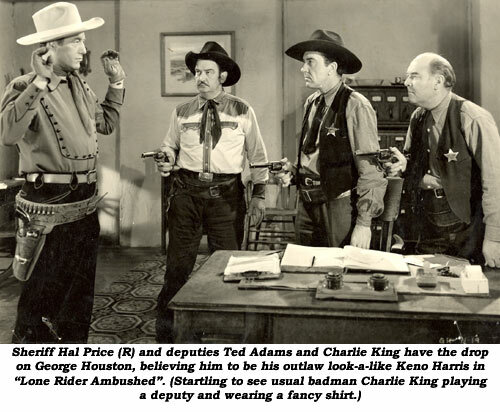 Startling to see usual badman Charlie King playing a deputy and wearing a fancy Gene Autry-style shirt. “LONE RIDER FIGHTS BACK” (‘41 PRC) This one opens up with a dandy of a barroom brawl, then badmen Frank Hagney, Charlie King, Frank Ellis and Dennis Moore go after leading lady Dorothy Short’s gold rich ranch. However, The Lone Rider and sidekick Fuzzy St. John intervene. Leading lady Dorothy Short was once married to Dave O’Brien who was in dozens of B-westerns both as a star and a badman. Screenwriter Joseph O’Donnell must have seen Kermit Maynard’s “Galloping Dynamite” (‘36) because he uses some of the same plot ploys setting one outlaw against another in eeking out justice. “LONE RIDER AND THE BANDIT” (‘42 PRC) In 1853, Joaquin Murrieta, who terrorized the Mother Lode region of California, was reportedly killed. But now there’s reason to believe Murrieta rides again as a new wave of robberies plagues the miners of Big Horn. Sheriff Dennis Moore sends for Houston, The Lone Rider, to help out. Shades of Don Diego/Zorro, George portrays a foppish wimp musician to throw the outlaws off guard while he impersonates Murrieta. Former Tex Ritter sidekick Slim Andrews has a brief comedy bit with Fuzzy St. John and Eddie Dean has a bit as a scruffy miner in the bar admiring Houston’s singing voice. The soundtrack on this particular Lone Rider sounds even worse than the usual inferior PRC track. “LONE RIDER IN CHEYENNE” (‘42 PRC) Dennis “Smoky” Moore catches the mayor and head of the cattlemen’s association (Roy Barcroft, Lynton Brent) robbing the bank. However, they turn the tables and accuse him. Rescued from jail by his pals, The Lone Rider and Fuzzy St. John, the trio returns weeks later to begin a campaign to smash the crooked city administration. The title is a complete misnomer as all the action takes place in Pecos City. When Moore returns to town weeks later, it’s totally implausible that Sheriff Jack Holmes doesn’t recognize him, after all, he’s a boy he raised! At one point Houston and Moore are at odds with one another—part of the screenwriting “Oliver Drake formula” of pitting the two heroes against one another before joining forces in the end. This is an excellent head-badman role for pre-Republic Roy Barcroft. Fuzzy trying to thread a needle produces a genuine belly laff. “TEXAS JUSTICE” (‘42 PRC) Rustled cattle are being hidden on rancher Karl Hackett’s back 40. Claire Rochelle, the widow of a hanged outlaw, is operating the rustling ring with her gang, who are hiding out masquerading as Monks at a mission. The Lone Rider masquerades as a Padre himself to get into the mission and see what the gang has planned. Dennis “Smoky” Moore and Fuzzy St. John are along for the rather blah ride. Too little hard action to satisfy. Factor in weaker than usual villainy and you have the most ineffectual of the Lone Rider PRC’s. It is a treat, however, to watch Fuz roll a cigarette one-handed while riding. “BORDER ROUND-UP” (‘42 PRC) Badman I. Stanford Jolley and his rattlers kidnap kindly John Elliott intending to force him to reveal the whereabouts of his gold mine. The Lone Rider and his pal, Fuzzy St. John (How can he be alone if Fuzzy’s always there? ), along with Dennis “Smoky” Moore, intercede to help Elliott’s daughter find her Pop. The badguys use carrier pigeons to transfer messages between their hideout and Jack Kirk’s blacksmith shop in town. After Houston intercepts one of these messages, there’s a hilarious scene in a coffee shop between Houston and slow-witted Frank Ellis. There’s also some other funny scenes between Fuzzy and Ellis over a gold mine. 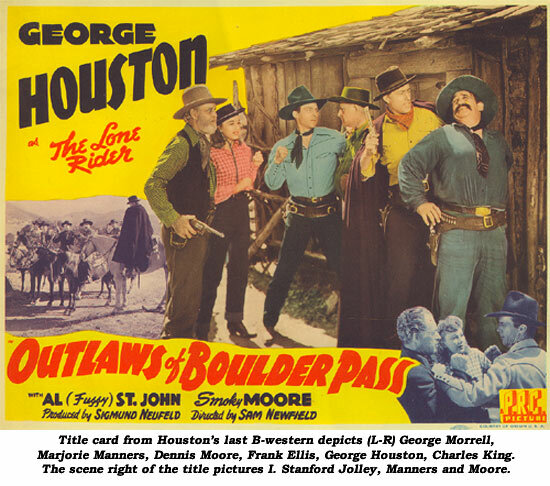 “OUTLAWS OF BOULDER PASS” (‘42 PRC) Uninvolving Lone Rider as George and Fuzzy come to the assistance of old friend Dennis Moore and Moore’s sister as I. Stanford Jolley and his gang, headed up by good ol’ Charlie King (in one of his delightful fraidy-cat dopey outlaw portrayals), operate a high priced cattle toll-gate. In a word, lackadaisical. This was the 11th and last of Houston’s Lone Riders. Bob Livingston finished out the series. The Houston/Lone Rider series has taken a lot of knocks by western critics but, in retrospect, they’re all full of fun, action and good B-western casts. The personable Houston acquits himself far better than some other B-stars we could mention. His main drawback was his operatic singing voice…good, but not suited for westerns. Houston (1896-1944), son of a New Jersey clergyman, received degrees in voice and teaching music from the Institute of Musical Arts in New York (now the Julliard School). From 1915-1918 he was a member of the French Ambulance Corps, then entered Rutgers University. His strong baritone voice landed him on Broadway in ‘27 for “The Abduction From the Seraglio” and in ‘28 for “Chee-Chee”, an original musical comedy, followed by roles in several operettas. Coming to Hollywood in ‘34, his voice was heard in “Masks and Memories”, “The Melody Lingers On”, “Marie Antoinette” and others before he became the singing ‘Lone Rider on the Plains’. 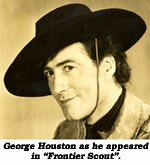 But opera singers do not make singing cowboys, so Houston went back to New York to find work. Married to light opera singer Virginia Card, George died two years later on November 13, 1944, at 47, of a heart attack one evening near Hollywood Boulevard. He was on the eve of a nationwide operatic tour sponsored by the Theatre Guild of New York.